Broken L Badlands - Apache County, Arizona, Headquarters West Ltd. Located 35 miles north of St. Johns, Arizona and approximately 10 miles west of Witch Wells, or the intersection of US 191 & State 61 in eastern Apache County. The north boundary of the ranch is directly adjacent to the Navajo Reservation (New Lands). Access is provided by US 191 to County Road 7230, then west 10 miles to the ranch boundary. There is a locked gate providing access directly off of #7230 into the ranch. Numerous private dirt ranch roads provide access throughout the interior of the ranch. Broken Badlands Ranch is approximately 3-4 miles from north to south and five miles from east to west. The ranch is in a checkerboard fashion with alternating private and state/federal lease lands. 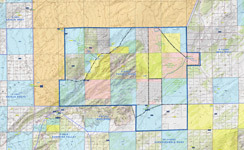 There is nearly 5.5 sections Arizona State lease, 2.5 sections BLM lease and 6 sections open range grazing in addition to the 1,760 deeded acres owned. The ranch is very well improved for livestock use. There are four wells equipped with solar pumps each with newer poly storage tanks and numerous drinkers. Two of the wells supply nearly five miles of pipeline. There is a large dirt tank near the center of the ranch for additional water. The ranch is fenced and cross fenced into three main pastures and two smaller holding traps. The fencing is in new or newly repaired condition. There are three range corrals located on the property where cattle can be gathered for doctoring, branding or loading. *Carrying Capacity is based on the State and BLM recommended stocking rate of 7 animal units per section. There are no public utilities available to the ranch or in the area. Cellular service is available on the ranch. Livestock water is provided by four wells each equipped with solar submersible pumps producing between 1.5 to 2.5 gallons per minute. Each well is equipped with new poly storage tanks with total storage capacity over 100,000 gallons in seven different locations. There are nearly five miles of pipeline with numerous livestock and wildlife drinkers scattered throughout the ranch.